This week, we move into Visual Literacies with Digital Writing Month. We continue to discover ways to engage people collaboratively, and the latest project is an inspiration by my friend, Kim Douillard, whose weekly photographic prompts are just a wonder in and of themselves. As Kim is a guest contributor to the Digital Writing Month site this week, I asked if we could take her latest theme of “the sky” and turn it into something larger: a collaborative, global photo journal of people documenting the skies. You are invited to join us, too. Head to the open Google Slide Presentation we are calling Our Eyes on the Skies, choose a slide, and upload an image of what you see when you look up. Add your geographic location, and name, if you are comfortable. 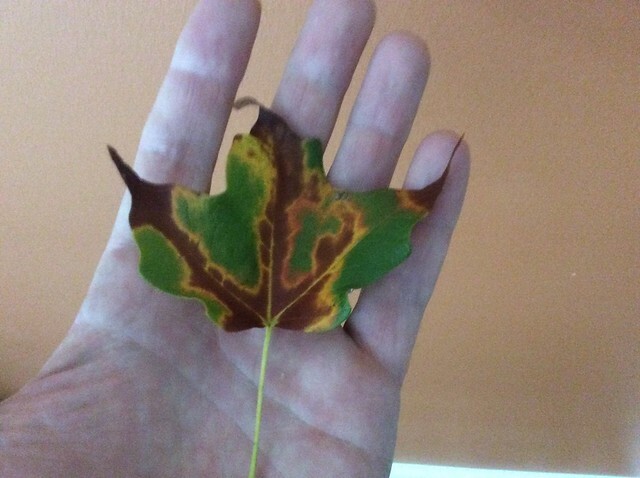 I found this leaf on a walk and it seemed to perfectly illustrate the start of something (Autumn) and the end of something (Summer) with its color pattern. The deep green, run through with golden brown. It is as if the leaf was resisting. Resistance is futile. Autumn is coming … maybe it is here. 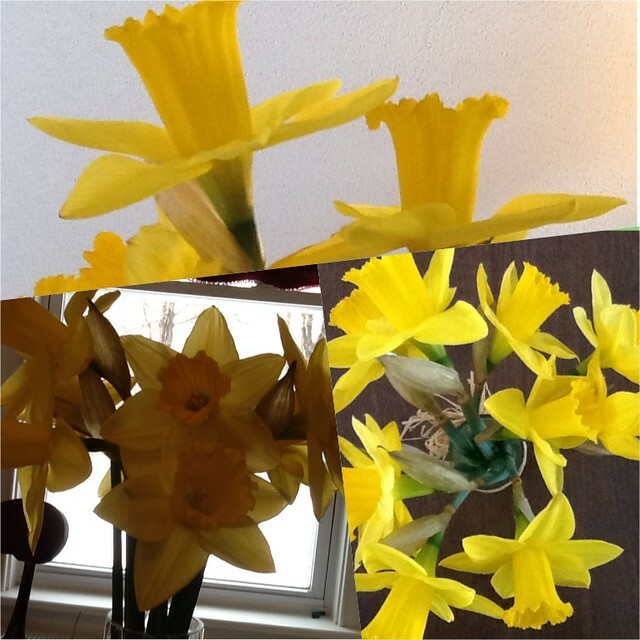 In another writing space with National Writing Project colleagues (including Bonnie), our good friend Kim Doullard hosts a Photo Fridays feature, where she shares photos on a theme and asks us to keep our lens open for possibilities. This week’s theme is all about “the overlooked” moments. 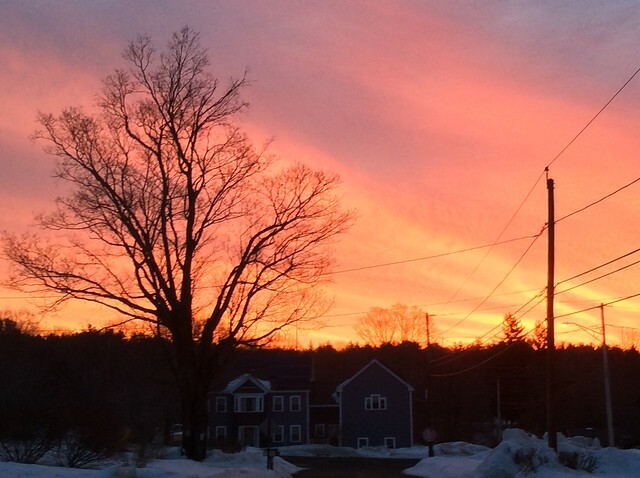 Last night as I was taking the dog out, I looked at the sky from our driveway and saw a plethora of colors in the night. The tree provides a nice frame, as does the stars in the sky, and the street/house lights give off yet another color. 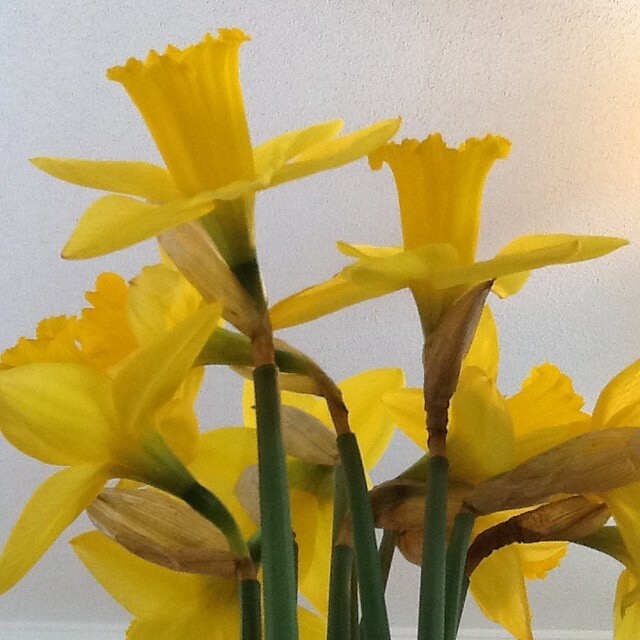 It’s the perfect image for a visual slice of life, and Kim’s advice to notice the overlooked dovetails so nicely with our writing activities, of noticing those things we see all the time but now we see them in a slightly different light. Turn your head a bit. Squint your eyes. Reframe what you see. Notice the overlooked. Over at another writing space where I “live” with words, our friend Kim has begun to prompt our thinking around the visual. So, today, this slice is more visual than written. Kim has us thinking “spring” this, which is difficult to do when our yard is still covered in snow and temperatures plunged again the other day. 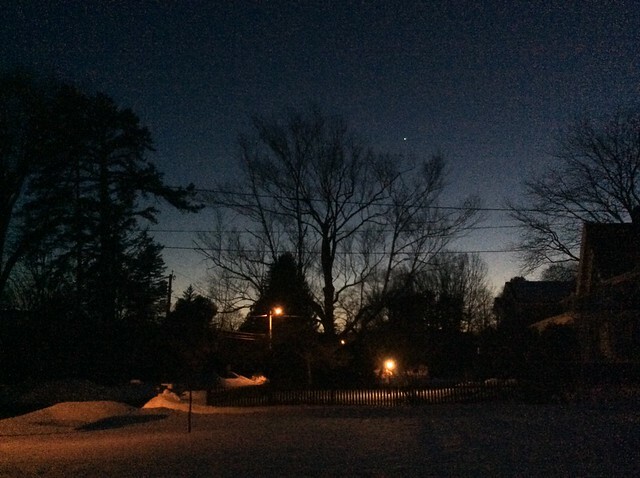 Spring has not yet sprung in New England … and yet … and yet, I saw a neighbor hooking up white buckets and tubing to his trees, anxious to catch the flow of sap when it begins. So, maybe he knows something I don’t know. 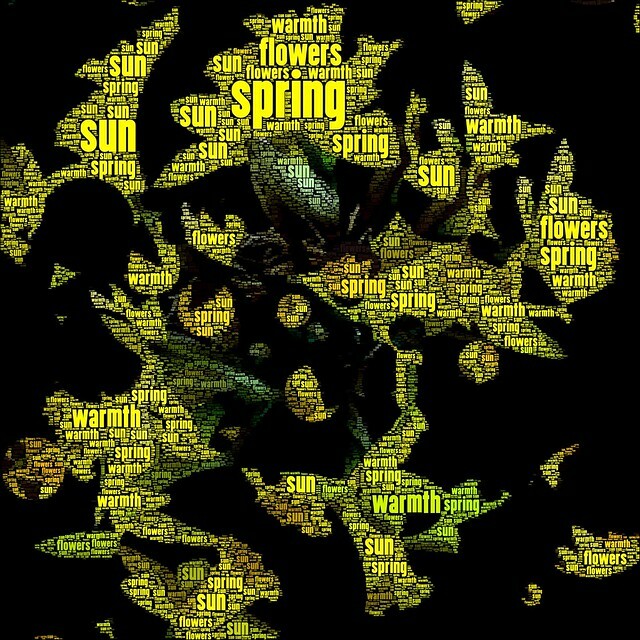 Maybe spring will actually come. For now, I have flowers in a vase, and this series of photos and filters is a celebration of the bright yellow on our kitchen table. I am hosting a weekly writing prompt at the National Writing Project iAnthology this week and I decided to make it visual. Folks are being asked to take a photo and share it. 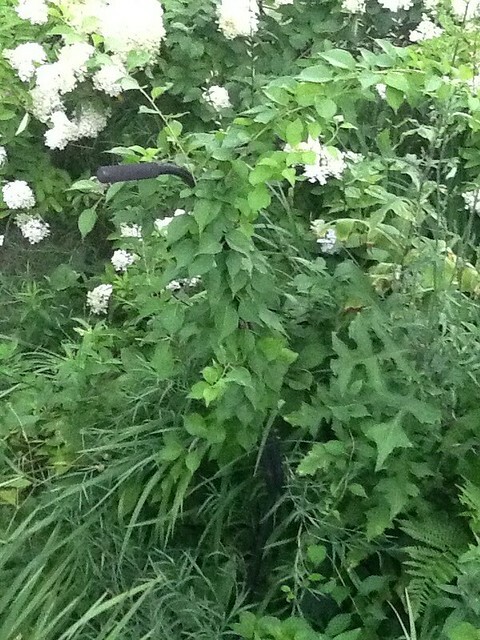 Here, I found my abandoned hand mower covered in vines. I think I neglected to show this video here. Bonnie Kaplan and I launched a project last year with our friends in the PhotoFridays Flickr group to send two little California raisin characters around the world. As they landed in different locations, folks took pictures of them, shared them with our Flickr group and the mailed them forward to the next person (Flat Stanley … eat your heart out!). When they finally came home, I took all of the images, wrote a song and then used Animoto to mix it all together. We have ambitions. And focus (for the most part). 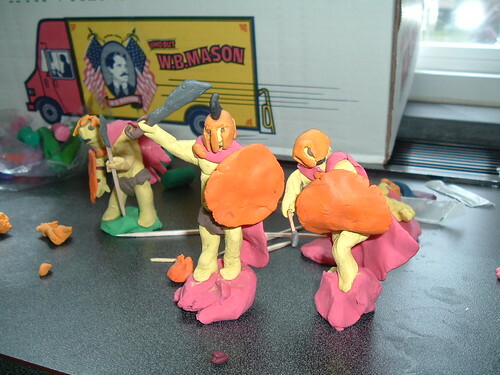 But whether my class can complete stopmotion claymation movies before our school year ends in three weeks is uncertain. We’re going to try. We’re going to try. And boy, they are very engaged for a June project. Since my literature groups just read two books that center on racism and tolerance (The Watsons Go to Birmingham and Roll of Thunder, Hear my Cry), I decided it might be interesting to have them create short claymation movies on the theme of “tolerance.” And so, we have stories developing, and clay characters being created, and next week: let’s get filming! One group of boys who have been loving the study of Sparta in Social Studies are working on a story with Spartans and how a group of hero-warriors come to understanding the differences of others. 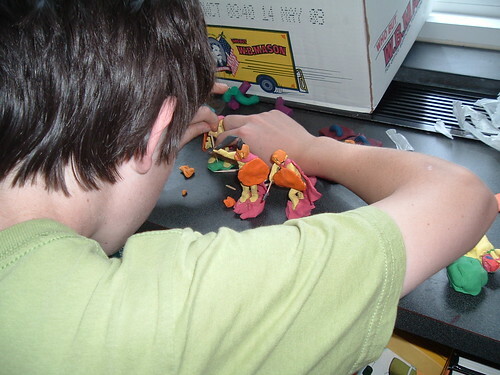 One particular student is very adept at clay and it is pretty amazing to watch him in action (his mother has been giving him clay to keep him busy since he was a little dude). I’m excited but stressed about finding enough time for them to create a movie they will be proud of before the school year ends. I’ll need to keep moving them along, pushing them to focus, and hoping the technology works as it should. During this school year, I have been taking photos of this lovely tree that stands above a picnic table just on the edge of our school recreational grounds. It’s been interesting to see how the tree changes as the year progresses and it became a way of marking time. 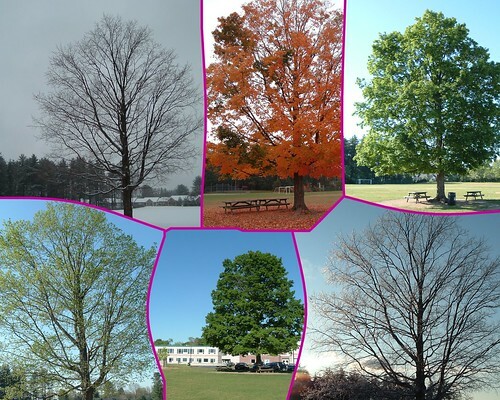 After one final picture of the tree back in full bloom, I decided to create a collage of the photos. We got ourselves a new dog. Some of you may remember that we put down our old dog, Bella, about 18 months ago and we have pined for a new one since then. 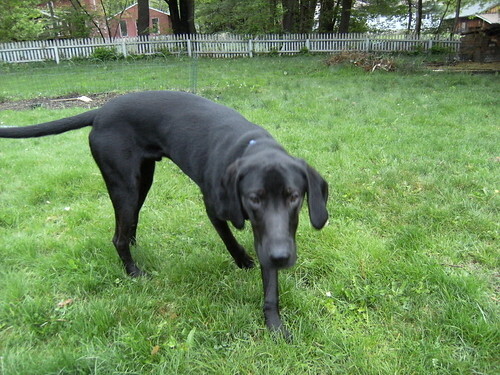 So, we “rescued” this lab/hound mix and he is such a sweetheart. His name is “Duke” and he is about 9 months old. The boys just love him and he is loving them right back. PS — this is my submission to the Photofridays project for this week. Come join us! What kind of whim is this? One I rarely pass up. I saw someone (Bud the Teacher?) post something about sending your name to Mars on a microchip in a future Mars Rover via NASA. This is my kind of adventure: I get to send part of me without having to endure the grueling travel. 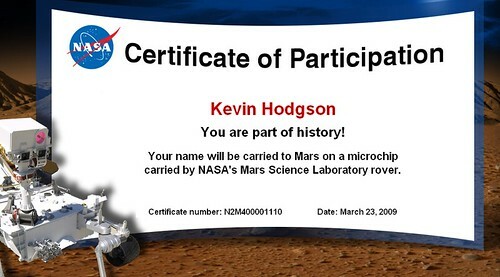 So, I did it, and now my name will be forever etched upon a chip heading to Mars, although whether anyone or anything(!) will ever read it is another story for another time (and another place, too, I bet).